Center for Computer Resources is located at 880 Munson Ave., Suite E. Traverse City, MI 49686. 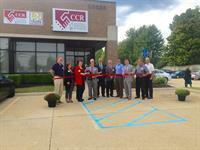 Center for Computer Resource, CCR, was founded in 1981 with the purpose of helping small businesses in Southeastern, Michigan with their IT servicing. 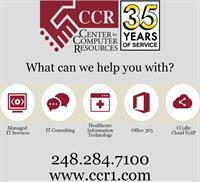 Since then, CCR has grown nationally and internationally to help companies get the most of their business technology. With over three decades in the business, CCR has extensive experience in transitioning clients from outdated systems to current technologies, as well as maintaining current systems. Our well-seasoned management team has collectively been in the industry for almost 100 years. With a wealth of experience in solving the IT problems for small and medium-sized businesses, we're dedicated and determined to making sure all of your systems are up and running, all of the time. Center for Computer Resources 35th Anniversary Open-House & Ribbon Cutting Event. Curtis Hicks II, President and CEO of CCR shaking hands with Sterling Heights Regional Chamber of Commerce President, Melanie Davis, during the Ribbon Cutting Ceremony. CCR Partners & Sales Representatives celebrating 35 Years of Business with clients at the Red Ginger in Traverse City. 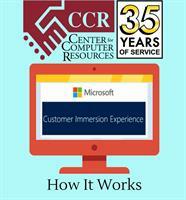 CCR offers your company the chance to learn tips and tricks to Microsoft products through our CIE program. These monthly training sessions give you a hands-on experience and the chance to learn new and helpful features.